*Disclosure: I received a meal at MOD in exchange for this post. The opinions expressed here, however, are my own. 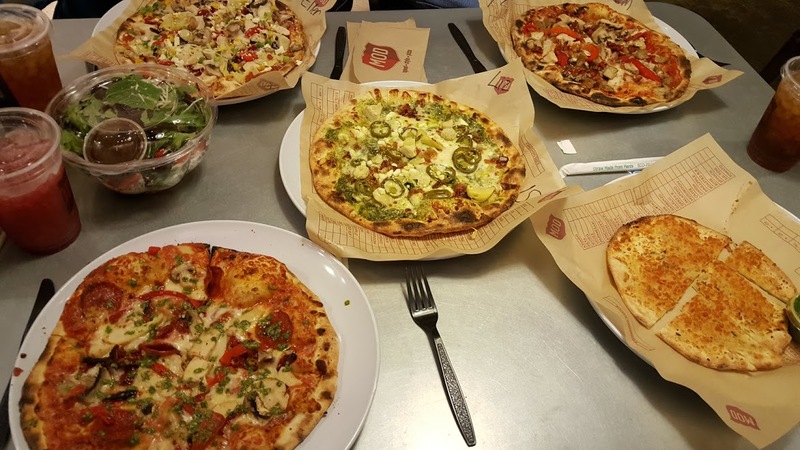 MOD Pizza in Northville, MI, opened in August 2015, and a Rochester Hills location opened soon after. 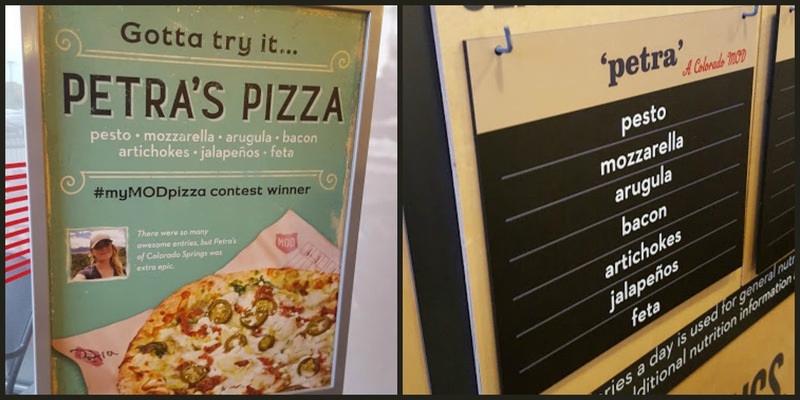 This month, MOD's across the country are celebrating National Pizza Month, and I stopped by the Northville location to check out the October seasonal pizza, the Petra. 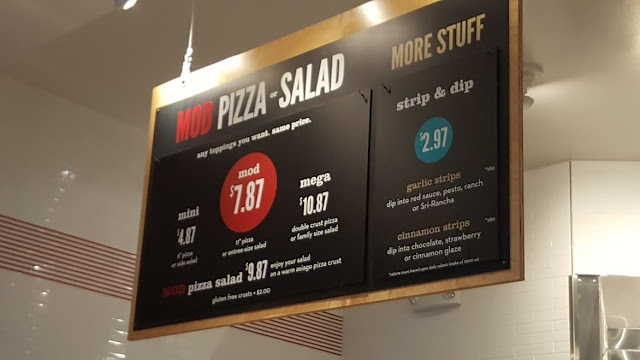 A regular-sized pizza is $7.87 at MOD, and that includes all the toppings you want. I highly suggest getting an order of the cinnamon strips, as well ($2.97), with cinnamon dipping sauce, as that's fantastic as well. 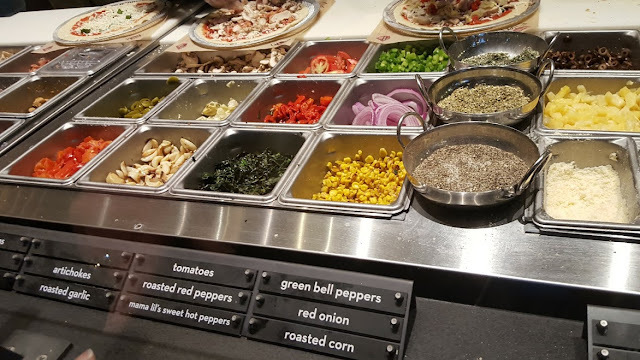 MOD has typical toppings you'd expect to see on a pizza - mushrooms, pepperoni, chicken, etc. - as well as some interesting ones like roasted red peppers, roasted garlic, and roasted corn (see above). I'm not super adventurous so I've never tried the corn on my pizza, but I love getting garlic and also pesto on mine. Every month, MOD has a seasonal pizza, and this month's was actually the creation of one of its customers, whose name is Petra (see pic on left). 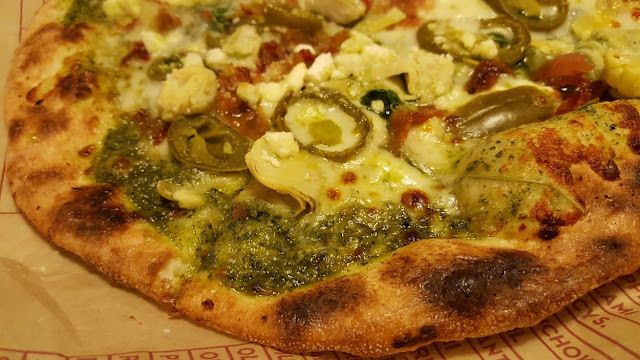 Petra's pizza includes pesto, mozzarella, arugula, bacon, artichokes, jalapeños, and feta cheese. My parents and I each did a build-your-own pizza, and then we split the Petra pizza. On my build-your-own pizza, I got pesto, garlic, chicken, mushrooms, pepperoni, red peppers, and sun-dried tomatoes as my toppings. The Petra pizza had a good pesto taste, which I liked, although it was a little spicy for me, with the jalapeños - however, at MOD you can customize your pizza as much as little as you want, so if I got the Petra again I would get it without jalapeños. We also split a salad and both the garlic strips and cinnamon strips, each of which come with your choice of dipping sauce - we got pesto sauce for the garlic strips, and cinnamon glaze for the cinnamon strips (SO tasty, and makes for a great dessert). Have you been to MOD before, or another fast-casual pizza place? What are your favorite toppings to include on your pizza?